Decadence mingles with simplicity in this exotic hideaway, which boasts an Asian-inspired flair. 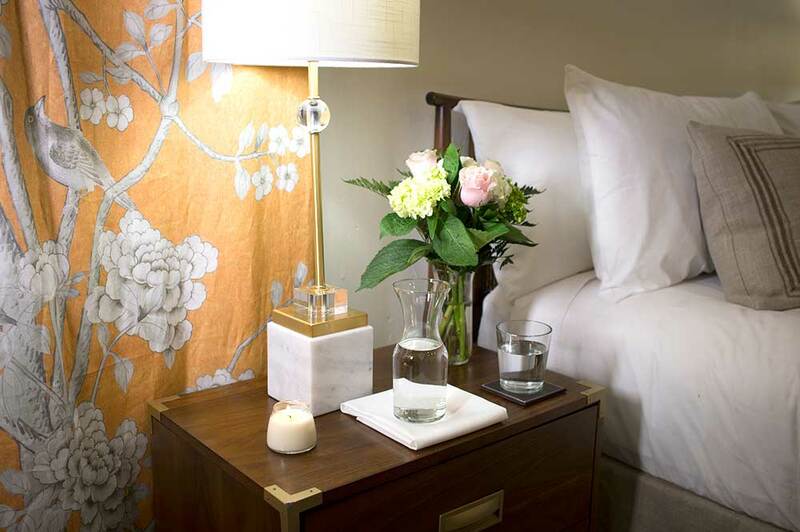 Stark white bedding dresses the plush King-size bed (with a firm, comfy mattress), which is flanked with wooden side tables that offer hints of gold. 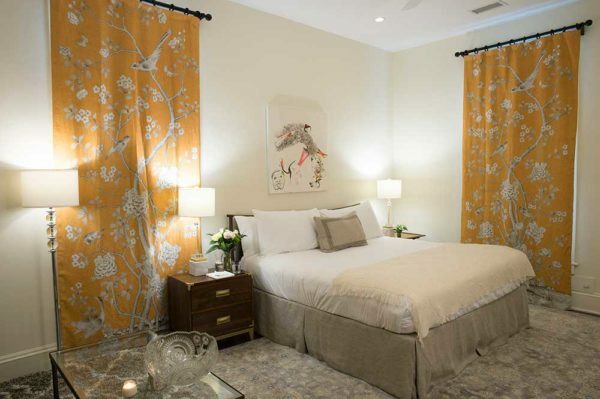 Luxe orange curtains flaunt a Chinoiserie design, which adds accents of bold color to the white walls. A pale gray and ivory Oriental rug brings more softness to the space. A chestnut-colored loveseat doubles as a sleeper sofa. The suite also features a 3-drawer dresser and a writing desk, which is outfitted with a leather writing pad. Guests can easily make the suite feel like home by storing their belongings and hanging their clothing in the large walk-in closet. 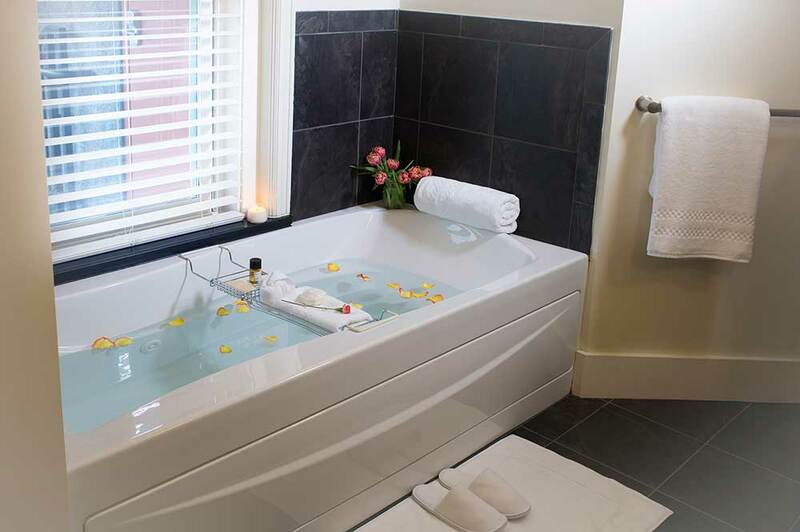 An en suite bathroom invites guests to indulge in the comfort of its Jacuzzi bathtub. A Smart TV invites guests to stream Netflix, Amazon, and beyond. Amenities include: En Suite bathroom, Hot Tub/Jacuzzi, Lounge area, Wheelchair accessible suite/Elevator, Complimentary Wi-Fi, iPod Dock, In-suite mini refrigerator and freezer, In-suite Keurig tea/coffee maker, Cable/Satellite 54″ Flat Screen Smart TV, CD/DVD Player, In-suite iron and board, Individual AC/Heat control, Radio, Alarm clock, Safe Box, French terry-knit robe, Luxe spa slippers, Linens and Towels provided, Towel Heating Rack, Complimentary Toiletries, Hair dryer. 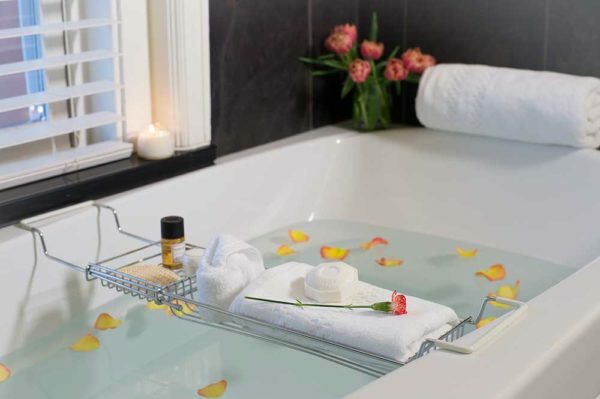 Learn about all the amenities offered at the Barrington B&B. All rights reserved. 2019. The Barrington. Website design by Thorunn Designs.